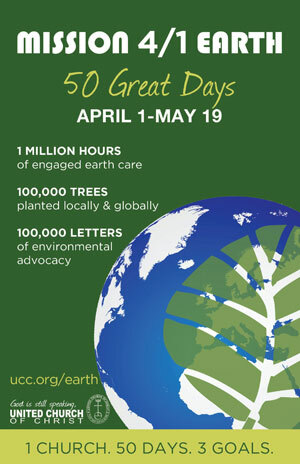 Join your sisters and brothers in the Massachusetts Conference and the entire United Church of Christ on a shared resurrection witness for Planet Earth during 50 great days of greening up, powering down and shouting out for the environment! "Mission 4/1 Earth: 50 Great Days" is about living boldly Jesus' let-your-light-shine proclamation in the Sermon on the Mount: "That they may see your good works!" It is an opportunity to live out our faith - in unity, as one church - for the sake of our fragile planet Earth. collectively offer more than ONE MILLION HOURS of engaged earth care, including clean up, advocacy, education, and behavioral changes that will impact the environment. collectively plant more than 100,000 TREES locally and globally in partnership with the National Arbor Day Foundation and the UCC's denominational partners around the world. collectively write/send more than 100,000 ADVOCACY LETTERS on environmental concerns to elected officials and local and national newspapers. Mission 4/1 Earth links together four significant events - Easter (March 31), Earth Day (April 22), Arbor Day (April 26) and Pentecost (May 19) - for a sustained, aggressive and collective mission opportunity for the entire United Church of Christ. Together, we will inspire and aspire to what we can accomplish as ONE CHURCH.